LG is giving its flagship smartphone a significant boost with future-proofing upgrades to make it faster and last longer. 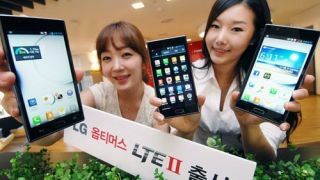 The South Korean company launched the LG Optimus LTE II in its native country. The Optimus LTE II's biggest claim to fame is that it marks the first smartphone available to sport 2GB of RAM. To help support the increase in power it a larger removable 2,150mAh battery, which LG claims lasts 40 percent longer than that of the previous Optimus LTE. The Optimus LTE II also sees a screen size change, with a bump up from 4.5 inches to a new 4.7-inch display that features the same impressive True HD IPS technology for 1280x720 resolutions. It runs on a 1.5GHz dual-core Qualcomm processor and Android 4.0 Ice Cream Sandwich topped with LG's Optimus 3.0 UI. There is also an 8 megapixel camera in the rear complimented by a 1.3 megapixel front-facing camera, 16GB of internal storage, and expandable memory with a microSD card slot. LG says it only plans to release the Optimus LTE II in Korea, but will have similar handsets down the road for release elsewhere. Perhaps something like the rumored LG Eclipse 4G LTE, which is said to also pack 2GB of RAM with the added benefit of a 1.5GHz quad-core Snapdragon S4 processor. With specs like those LG could gain an edge over competing high-end handsets that have yet to break the 2GB of RAM barrier like the HTC One X and Samsung Galaxy S3. LG hasn't always been been a safe bet in terms of sales, with the company losing traction as its feature phone sales declined. But with a renewed focus on smartphones as of late, the handset maker hopes to turn that trend around. The Optimus LTE already started the company's turn around, reaching one million sales in its first four months. Those numbers won't be competing with the iPhone any time soon, but it was enough of a step forward for LG to claim it has turned a corner in the right direction as a company. Now with the launch of the Optimus LTE II, LG is hoping lightning can strike twice. The firm is projecting a 75 percent increase in its smartphone sales for 2012, with smartphones making up 44 percent of its overall mobile phone sales. A year ago that would seem a lofty goal, but with impressive hardware like the Optimus LTE II behind it, LG shouldn't be counted out yet.